Human body needs fats to function and survive. Our body can produce most of the fats it needs. However there are two types of fats that human body cannot produce, namely linoleic acid (Omega-6 ) and alpha-linolenic acid (Omega-3). These two fatty acids are very critical to proper functioning of the body. These beneficial fats are the Essential Fatty Acids (EFA’s). They are essential because the body cannot produce them and they must come from our diet. EFA’s are polyunsaturated fats, and are also known as “good” fats. Just like other essential vitamins and minerals. EFA’s are necessary for the maintenance of good health and growth. Our body needs both the groups of essential fatty acids (EFA’s) to survive and function optimally.Essential fatty acids control a large number of body mechanisms like improving the flexibility of cell membranes and increasing the immunity levels.These fats also help keep toxins out and bring nutrients into your cells. Additionally, a diet rich in EFA’s can be helpful in many diseases. The increased intake of essential fatty acids in the correct manner can not only improve health and keep diseases away but also improve body composition, skin, mental and physical performance of an individual. In the modern times for various reasons, like a universal fear towards fat, there is a huge deficiency of EFA’s among the general population. Also researchers have found a growing disproportionate intake of Omega-6 fatty acids over Omega-3 fatty acids. Here it’s essential to understand that Omega-3 and Omega-6 don’t have the same effects on human body. Omega-3s have an anti-inflammatory effect whereas Omega-6s are pro-inflammatory. Inflammation protects the body from various infections and injuries but too much of inflammation of tissues can lead to various diseases like cardiovascular ailments, arthritis, Alzheimer’s and in some cases cancer. To put it simply, a diet that is high only on Omega-6 and low on Omega-3 is not healthy. The body needs a balanced amount of each to function optimally and stay healthy. 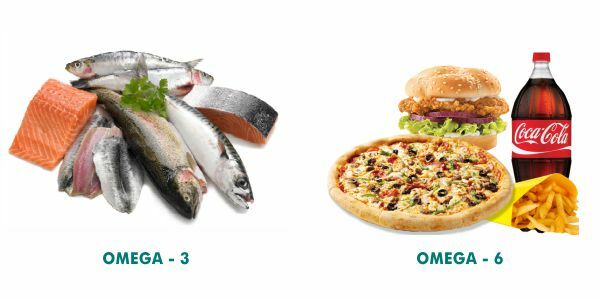 Due to this opposing effects of omega-3 and omega-6 fatty acids, the optimal omega-6 and omega-3 ratio as per various researchers is about 1:1. The bottom line is that you do not always need to sit down and calculate the ratio of Omega-3 and Omega-6 intake as your ratio will be adjusted naturally if you have a balanced healthy diet. Just pay attention to the fact that you eat loads of fruits, vegetables, whole grains, legumes, sea food and limit the intake of processed food and processed oils. A balanced diet with right amount of EFA’s is not just beneficial for adults but is also very important for the complete and healthy development of your child. A wholesome diet along with supplements rich in EFA’s is the key towards a happy and healthy life!